You see them often on Twitter - "Happy publication day" messages to writers when their new books come out. Sometimes a book is published which makes me think that readers should send one another "Happy publication day" messages, because they know they are in for a good read. For me, The Fight For Lizzie Flowers by saga writer Carol Rivers is just such a book. I've been on the library waiting list for it since it came out in hardback; but Carol evidently has a lot of readers across North wales, because I'm still not at the top of the list. No matter. The paper back has come out and I've got my copy. Don't you love the moment when you finally hold the book you've been looking forward to? Last week I blogged about the TBR badge a friend gave me. I have to tell you that The Fight For Lizzie Flowers has by-passed my to be read pile and gone straight to the bedside table. How about you? Which books did you await impatiently? And which have recently by-passed your TBR pile? Lovely to hear from you, Jen. I think we all have favourite authors whose books go straight to the bedside table, don't we? I'm interested to see that you are looking forward to reading a collection of short stories. It has made me realise what a long time it has been since I read any short stories. A book by Kristan Higgins always by-passes my TBR pile. I'm also anxiously awaiting a book of short stories by Bess Streeter Aldrich. Not a new book, but one I couldn't access in the UK and now have on order from the US. I haven't read any of Carol's books so appreciate the recommendation. Have also noted the books others have recommended. I've not read Apple Tree Yard, Wendy, but the reviews have been excellent. As I enjoy books by Lisa Gardner and Tami Hoag, I think this one will be a great read for me too. Thanks for the recommendation. Apple Tree Yard bypassed my TBR pile... and I wasn't disappointed. Many thanks for your kind comments, Carol. I am always happy to support authors whose books I have enjoyed. And I can confirm that the plot of Lizzie Flowers is indeed living up to the attractive cover illustration! I have read some of Ellie Dean's books and I agree with you that having the boarding house and the Reilly family links the books in an appealing way. 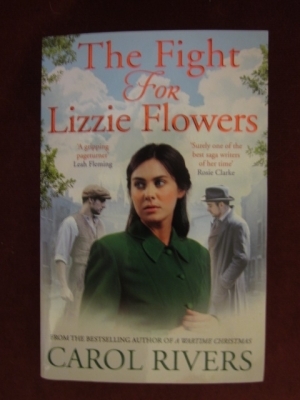 And I agree with you also about how attractive the cover of The Fight For Lizzie Flowers is. Simon & Schuster have given Carol Rivers' books truly beautiful cover illustrations in recent years. I always look forward to books by Jenny Colgan. I also read Ellie Dean's WW2 stories - I like the way the books are all linked by the Reilly family, who live in the boarding house, and the continuing story of the Reillys forms a back-drop to the story of the new heroine of each book. I know you aren't supposed to judge a book by its cover, but the cover picture on The Fight for Lizzie Flowers is lovely.